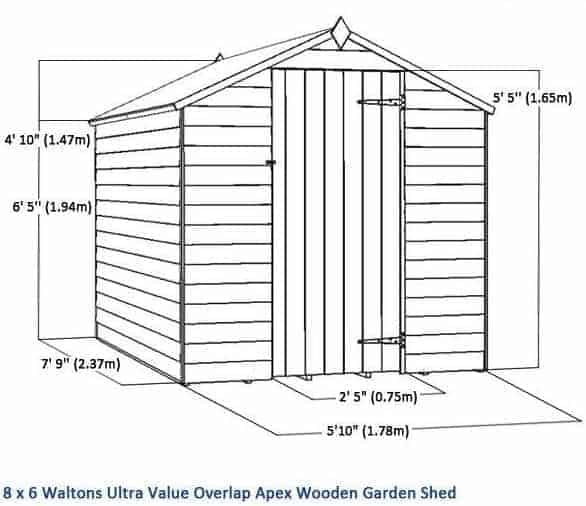 This is an 8 x 6 Walton’s overlap apex shed. The overlap cladding is the key feature here, because it provides immediate and tough resistance against rainwater. That adds lots of value to your construction, and makes it a perfect building for the garden. In addition to that, you also get a nice apex roof. This means more headroom for you, and when it comes to storage, you can bring tall tools in with peace of mind. They will not be damaged by a low roof. A finishing touch comes with the fact that the building has no windows, so you have natural added security. 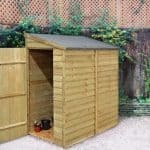 We were interested to see what the fuss was about with this popular 8×6 Waltons Ultra-Value Overlap Apex Wooden garden shed. It has received a lot of positive feedback and at first glance it has a fairly basic design. What we found was that while it may not have the most advanced features and design, it still manages to look quaint; adding real character to the garden. The ultra-low cost hasn’t taken anything away from the solid, stable construction. 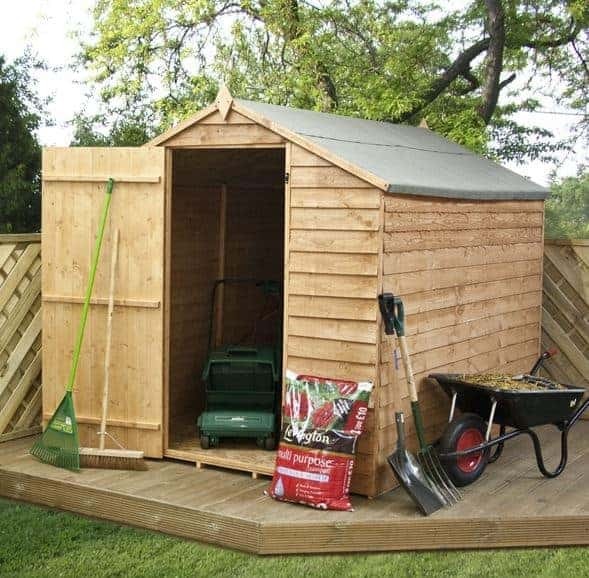 It appears to be a very practical shed that is perfect for storing all of your general garden equipment. Despite its ultra-value design, this model offers a fantastic range of features. Find out more about the main ones below. 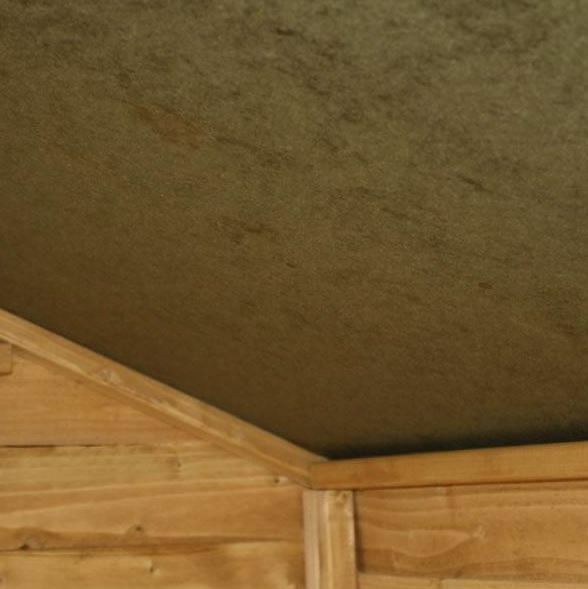 Free roofing felt – Know that the roof is protected thanks to the free, high quality roofing felt included with the shed. Double framed corners – Designed with extra stability in mind, the double framed corners really help to strengthen the structure, providing a more solid design. Solid sheet roof and floor – Both the roof and the floor benefit from solid sheet material for extra stability. Butterfly catch – Ensuring the door shuts tight, the butterfly catch is a useful addition to the shed. Floor joists – The floor joists help to lift the floor off the ground, helping to protect it from damp. They also provide more stability for the base of the shed. Ledge door – Like many other Waltons sheds, this one makes use of a ledge door which provides space to install a staple and hasp for additional security. 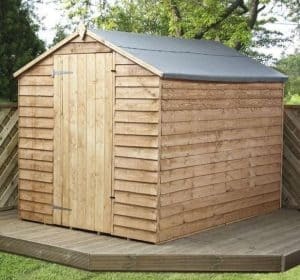 Made in the UK – One of the reasons this shed is available at such a low cost is because it is entirely constructed in the UK. Not only is it affordable, but you will also be supporting British manufacturing. 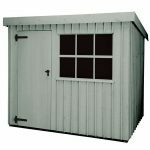 The secure and solid build of the shed is the main thing we love about this model. Not only are you getting a fantastic deal, but you’re also getting features that are commonly found on more expensive models. There are no windows so you won’t have to worry about anybody seeing into the shed. All of your stored items will remain completely private. The materials are also made to a very high standard. 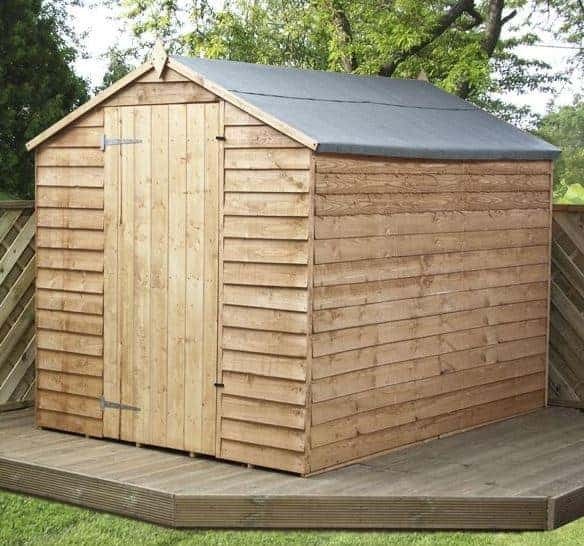 While we do love the safety features there is one thing we feel this shed is missing and that is a lock. You do have the option to add one as an extra, but without it the shed isn’t fully secure. 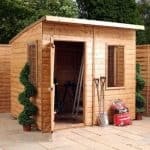 If you’re not a huge DIY fan you will be pleased to know the shed isn’t overly difficult to build. That being said, it isn’t overly simple either. While the instructions are extremely clear and easy to follow, it is quite heavy work. So you may want to rethink it if you are planning on constructing the shed by yourself. 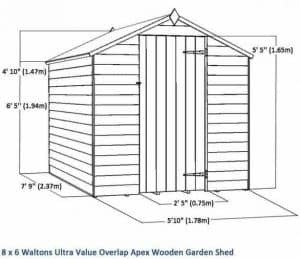 There are a few ultra-value shed in the Waltons range so we were interested to see how they compared. We found that this model is definitely one of the better ones. It has great features, has a nice strong build and the overlap cladding really helps to improve stability and strength. 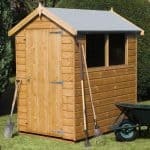 There are a lot of good things going for this shed considering it is a budget model. Now onto the cons. The unpainted finish might not be to everyone’s preference. It does give it a rather plain design. Of course, you could choose to paint it yourself, but that does involve extra work and additional expenses. As you can imagine, it also isn’t the sturdiest shed on the market. It does have a fairly secure build but you may find the solid sheet materials on the roof and the floor a little flimsy. This can be rectified if you invest in the extras such as the Portabase or the Extra Strength floor support pack. 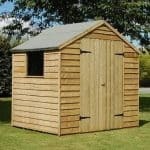 Overall we really recommend this shed for those who are looking for a basic storage facility. It is a high quality, low cost model that will fit in most gardens. 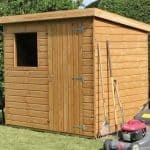 Considering it is ultra-value, it still comes with a brilliant range of features and with a few extras it can be turned into an ultra-strong, ultra-durable shed.